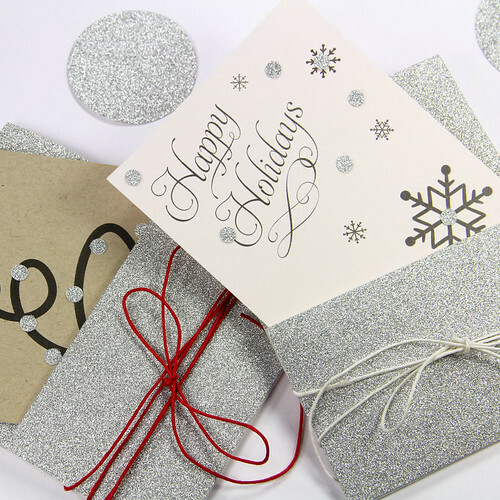 I'm thrilled that Kristen Desrosier of LCI Paper Company is back with another clever idea for those of us who love to make unique Christmas cards. (You might recall the Customizable Ornament Cutout Cards she designed for us last Christmas season.) 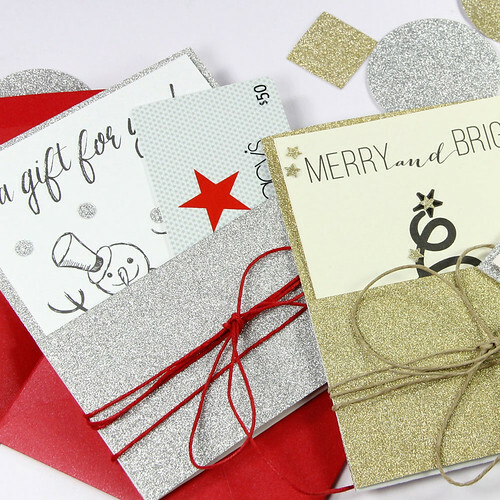 There's no way these festive pockets won't bring a smile to every person on your list. Welcome, Kristen! The holidays can be hectic. These pocket cards are not. 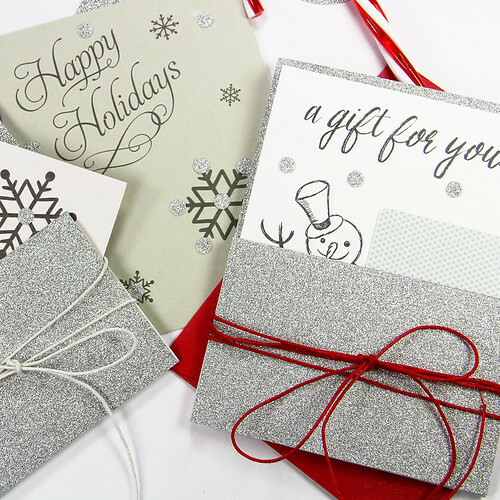 In this tutorial, learn how to make easy, personalized pockets for holiday cards, gift cards, candy, baked goods and more. 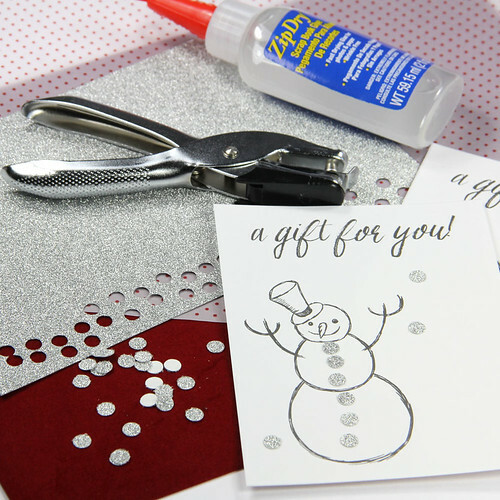 They are quick, convenient and can be made with any card stock and embellishments you have on hand. 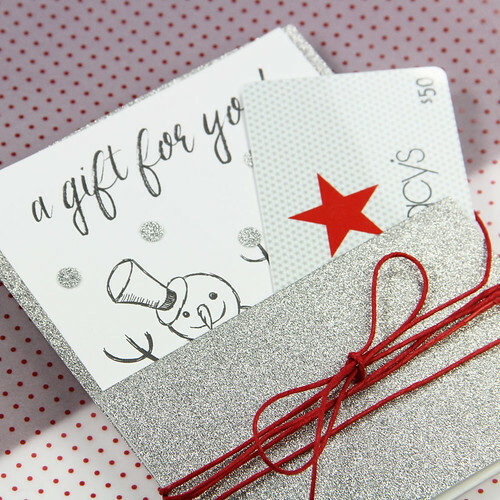 This year you'll be prepared when that last minute guest or swap gift pops up! 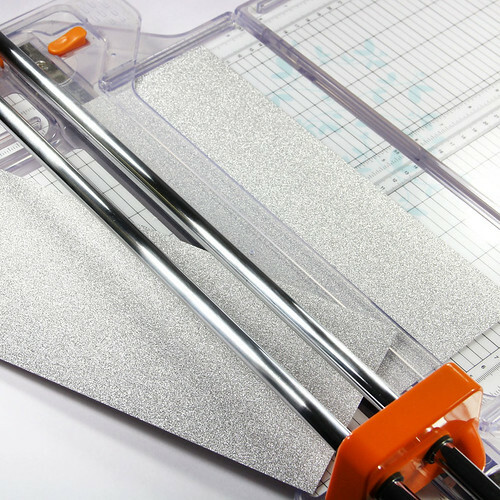 Using a paper trimmer or your preferred cutting tool, cut (1) 8 1/2 x 11 sheet of card stock down the middle to yield (2) 4 1/4 x 11 cards. 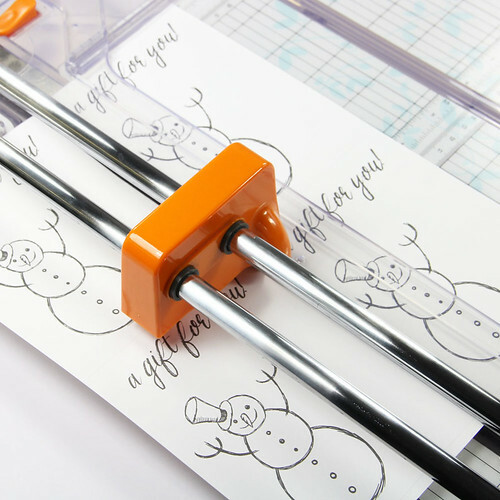 Next, score the 4 1/4 x 11 card at 5 1/2 inches, then again at 8 1/4 inches. Using the score lines as a guide, fold the card in half, inwards towards itself, at 5 1/2 inches. Next fold in the opposite direction, downwards, at the 8 1/4-inch mark. This will make a 4 1/4 x 5 1/2 (A2 sized) card with a 2 3/4-inch tall pocket. 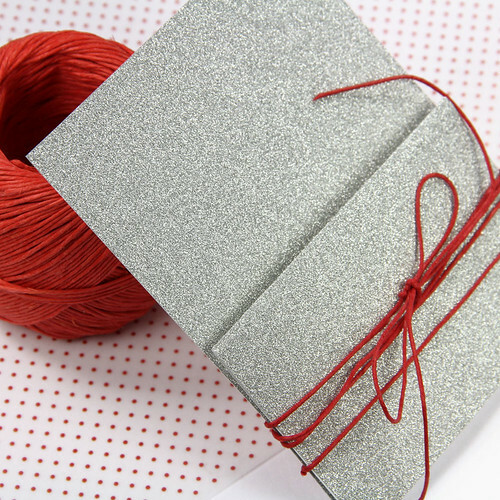 Wrap string, ribbon, or twine around the overlap of the pocket and tie to hold closed. 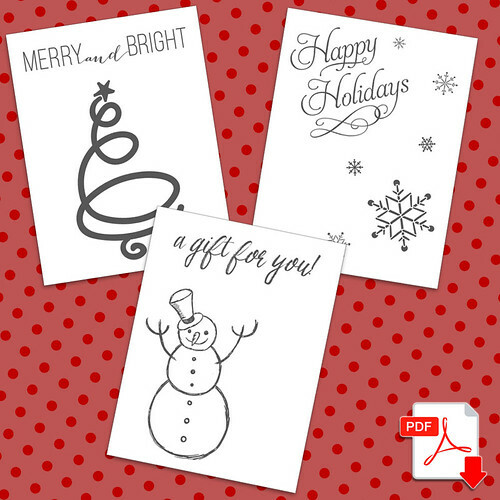 If you'd like to include a pre-designed card in your pocket, print your choice of (3) designs on 8 1/2 x 11 card stock. Designs are in charcoal gray and in PDF format with subtle cutting guidelines. PDF includes (4) 4 x 5 1/4 cards to (1) 8 1/2 x 11 sheet. 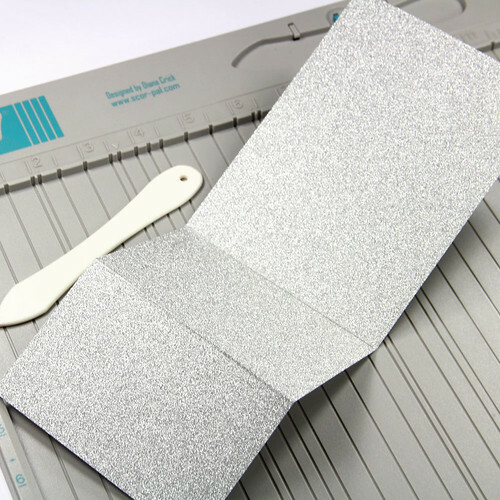 Carefully cut along the light gray guidelines to yield (4) pocket insert cards. 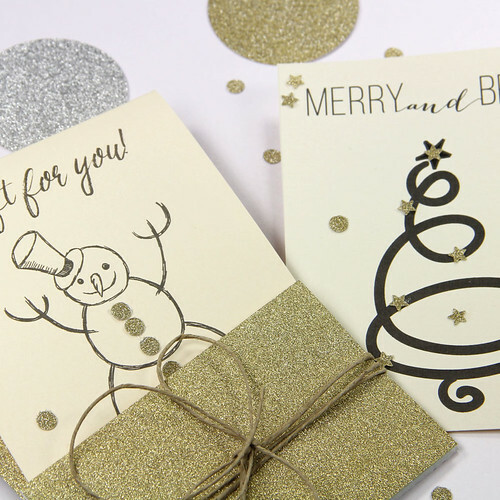 These cards were specifically designed for embellishing, so get creative! 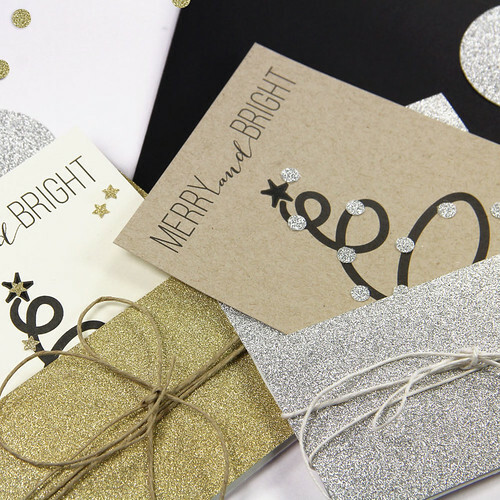 Here we grabbed matching glitter card stock, a hole punch and glue, but you can do whatever you'd like! Other fun ideas include loose glitter, gems, pom-poms, buttons, stickers... you get the picture. 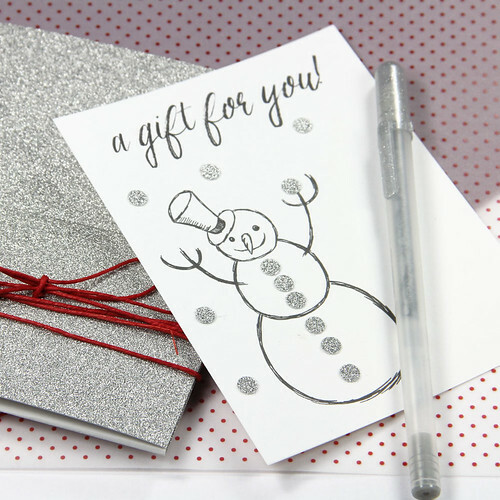 If you wish, personalize cards with a 'to/from' or other note. 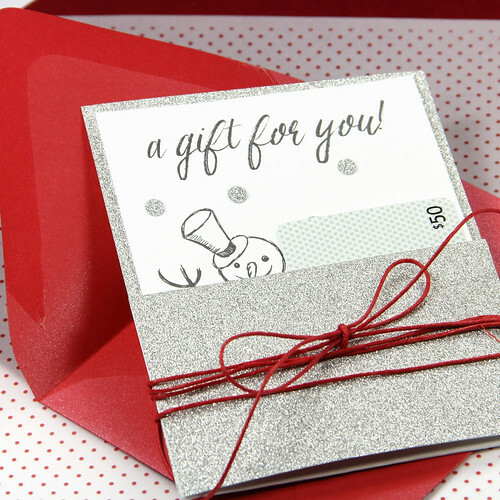 Insert your personalized card along with a gift card, photo, candy, trinket, etc. If you are mailing your pocket card, place it in an A2 (4 3/8 x 5 3/4) envelope and send it on its way. Thanks so much, Kristen! I love all of the designs, but the swirly tree has especially captured my heart as I'm such a fan of scrolls. It's cute the way you've decorated it with star and hole punchees as ornaments. ...and even as buttons for the snowman. 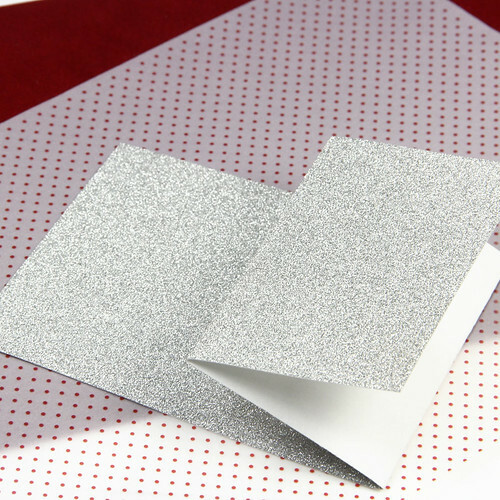 MirriSPARKLE Glitter Paper, flake-free and easy to cut and score, makes these cards extra special! Love this idea! I'll be making use of this for sure. Thanks so much! I'm glad to hear that, Michele Kay! Thanks for your comment.